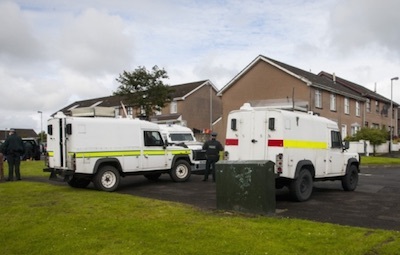 There has been an angry response after British soldiers mounted raids in Derry’s Galliagh area this week, with Sinn Fein describing them as “unacceptable”. The use of British army units to carry out policing functions appears to confirm fears of a return to occupation-style control in parts of the North. Last week saw intense raids and harassment of republicans in Derry following the appearance of an alleged INLA honour guard at the funeral of republican socialist veteran Peggy O’Hara, mother of hunger striker Patsy O’Hara. The PSNI in Derry admitted the move. It said “military specialists” had been called in to search for “munitions and explosive devices”, which it said was a “high risk search”. A large number of police accompanied the British soldiers, who were in plain clothes during the searches and also used white armoured vehicles. British Army jeeps painted white were also deployed at the search of two bungalows. Independent councillor Dermot Quigley called on the PSNI police to explain why homes were not evacuated if there was a risk to the public. “Or is it the police trying to bring British soldiers back onto our streets by stealth,” he said. It is understood the British Army has also been deployed to the Lurgan area. The personnel were again not wearing standard military fatigues but dark grey boiler suits similar to those worn by the PSNI, with hard hats. The military vehicles used were painted white. The British army are accountable only to the British government, and their presence on Irish streets is being seen as a sign that the ‘normalisation’ agenda has failed. Sinn Fein’s Gerry Kelly condemned the move and blamed the deployment on the PSNI. “The Good Friday Agreement and the promise of a new dispensation for policing was about making policing accountable to the community and did not include the British Army. I want to know at what level in the PSNI was the request made to bring in the presence of the British Army. East Derry DUP MP Gregory Campbell said that British military personnel had been deployed in the Derry area 168 times in a five-month period. “Gerry Kelly should cease his faux rage at the soldiers being deployed in Londonderry and instead focus on the reason why there needed to be such a police operation in the first place,” he said. In Ardoyne in north Belfast a British army unit conducted a six hour search of the old St Gemma’s school site two months ago, assisted by the PSNI who provided back up. On that occasion the soldiers were dressed in jumpsuits rather that in full military uniform. Ardoyne republican Aidan Ferguson said it was a “myth” that members of the British army were no longer active in Ireland. “People were fed the lie that there were no longer British soldiers on the streets but that’s a political myth. They have always been active in republican areas. In fact it’s becoming a more common occurrence. The fact they try and disguise their presence wearing PSNI style uniforms is fooling no one”, he added. British military personnel have also been involved in surveillance operations against nationalists using equipment such as spy drones. Concerns have again been raised about the role in Ireland of ‘elite’ British military units such as the Special Reconnaissance Regiment and MI5 after it was revealed that the agencies could be carrying out surveillance on nationalist politicians. It emerged this week that a decades old convention not to tap the phones of politicians has been quietly scrapped. Sinn Fein MP Pat Doherty said the development is “an attack on democracy” but claimed his party has always been under surveillance. “British intelligence not only routinely listened to the phone calls of Sinn Fein MPs, including conversations with 10 Downing Street, they also bugged Sinn Fein offices, the cars and homes of activists and orchestrated assassination attempts on Sinn Fein elected representatives by loyalist death squads.